Plowns showcases and encourages the creativity of kids by sharing it with a like-minded community of parents globally. 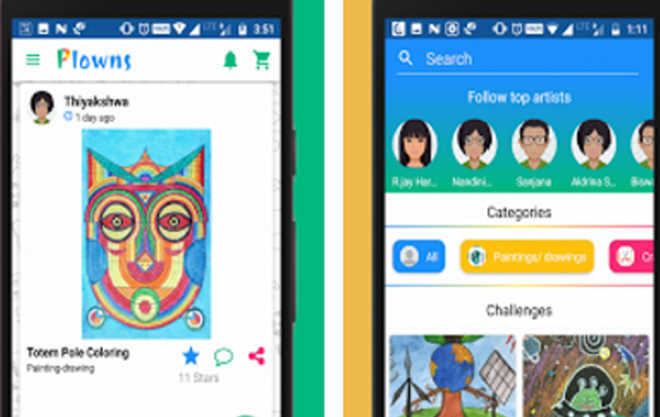 A mobile application promises to help unleash the creative potential of the next generation of Indian children. “While doing my masters in Computer Science from the US, I noticed a stark difference: my fellow American students were all very multi-dimensional — in addition to studies they were good at music, or sculpting, or sports — whereas most of the Indian students were book-worms. This showed up as a difference in creative problem-solving abilities,” says Harshdeep Jawanda, founder of ‘Plowns’. Harshdeep, himself a new father, didn’t want his daughter to grow up in a society where studies, especially Maths and Science, were all that mattered. “She should be able to grow in all directions and choose what she wants to do with her own life,” he says. Along with like-minded thinkers Adarsh and Gajendra, he is now working to bring that dream to fruition. Anything that can be captured as an image can be shared on Plowns. When people other than grandparents, uncles and aunts express their admiration of their creativity in the form of stars and comments, it gives children a much-needed boost in confidence and encourages them to do more. The experience begins with creating an account on Plowns. Even if parents aren’t ready to share their little one’s creativity right away, they can take a look at what other kids in the same age group are doing. As a community of parents (and kids) interested in creativity, the atmosphere is very positive and encouraging. Stars and comments from community members never fail to put a smile on the young creators’ faces. Discovery features in the app let parents look for inspiration for the next creation by their kids and find out what other kids the same age are doing. For those living in rural and semi-rural areas, Plowns is their connection with the creative world. Arts and crafts might be the obvious manifestations of creativity that come to mind, but the creative kids of Plowns upload essays, infographics and scientific models to share their creative side. One child showed double creativity: not only did he create a science model, he also made and uploaded an animated GIF of it to show its working! For parents, Plowns is also the digital repository of all of the fond memories of the things their children have done in the past. While parents would love to, physically preserving all the little colouring books and Play Doh creations of their kids is a headache. With Plowns as their digital storage, they never need to lose a fond memento from their kids’ lives. Sharing is another big feature of Plowns, allowing kids to bridge the geographical gap to their grandparents and send them handmade birthday greeting cards by uploading to Plowns and sharing them. This would be certain to bring a smile to any doting grandparents’ face. Plowns has seen more than 20,000 uploads, 1 lakh stars and tens of thousands of comments so far. The Play Store app was installed over 20,000 times within months of launch. The team has many new features planned. One of these is going to be private sharing, allowing parents to share photos privately only with a select few.